If you were among the many fans of Superman between 1940 and the 1960s, you saw the work of Wayne Boring, a Ridgefield cartoonist who brought the man of steel to life for millions who read the newspaper comics. Born in 1916 in Minneapolis, Mr. Boring studied at the Chicago Art Institute where he took a course by J. Allen St. John, the then-famous illustrator of the Tarzan books, to learn how to produce the muscular, Tarzan-like figure. In 1940, after a stint as a newspaper illustrator and some freelance comics work, he was hired to help illustrate the new but growing Superman strip, started in 1938 by Joe Shuster and Jerry Siegel. At first he “ghosted” strips, filling in bodies after Shuster drew the faces. By the mid-1940s, he was the sole illustrator of the daily and Sunday comics and by 1965 had drawn more than 1,350 Sunday and 8,300 daily Superman strips, and also did some of the comic books. In all of those strips and books, incidentally, he never once drew Superman changing into costume in a phone booth, a TV series technique that always annoyed the artist. In 1957, Boring moved to Lincoln Lane in Ridgefield. 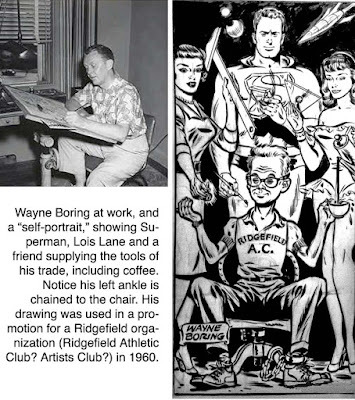 Eleven years later, DC Comics started cost cutting and dismissed several of its veteran artists, including Mr. Boring. He then ghosted backgrounds for Prince Valiant series by Hal Foster, who lived in Redding, until 1972. He also drew for Marvel comics on and off, but late in life was forced to work as a bank security guard in Florida where he died in 1982. "Wayne Boring's Superman is one of the most enduring characters in the comics hobby," a comic art historian has written. "Boring's stylized artwork and fine linework along with his ability to handle science fiction subjects has made him one of the most popular artists of his time, and among the most remembered in comics history."